Officials from the Danish Office of the State Prosecutor for Serious Economic and International Crime (SØIK) conducted a three-day training course on anti-money laundering and countering the financing of terrorism (AML/CFT) for Ethiopian officials from key national institutions such as the Financial Intelligence Center, National Bank, Federal Ethics and Anti-Corruption Commission, Revenues and Customs Authority, and Ministry of Justice, and for the private sector. This training, entitled “Advanced Financial Intelligence I,” was the inaugural workshop in a series of trainings being delivered through the CGCC project “Strengthening Anti-Money Laundering and Countering the Financing of Terrorism Capacities in Ethiopia." Mr. Gemechu Weyuma Lulesa, Director General of the Ethiopian FIC, officially welcomed participants to the training, which was delivered by Mr. Jens Kauffeld Andreasen, Detective Superintendent of SØIK, and Mr. Martin Kallehauge, Head of Asset Recovery of SØIK. 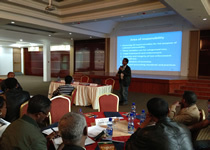 The interactive training format offered participants the opportunity to engage in small group exercises and present to one another on a range of topics such as predicate crimes, and the roles and expectations of reporting entities, as well as Ethiopia’s progress in adhering to and implementing international instruments and FATF standards. The first day was structured as a train-the-trainer course for FIC staff, specifically focusing on the development of standard operating procedures for the institution. The second and third days were inclusive of FIC staff as well as representatives of the seven teams taking part in Ethiopia’s upcoming National AML/CFT Risk Assessment. Trainers facilitated discussions among participants on ways to enhance inter-agency information sharing and cooperation.